Ayurveda is a type of alternative medicine that developed in the Indian subcontinent. It is claimed that the medicine practice dates back to prehistoric times. While some concepts of Ayurveda do date back to the Indus Valley Civilization and earlier, Ayurveda significantly developed during the Vedic period and later. Some of the oldest known Ayurvedic texts include the Suśrutha Saṃhitā and Charaka Saṃhitā which list the eight canonical components of Ayurveda. According to Suśrutha Saṃhitā, Dhanvantari, the god of Ayurveda and the physican of the gods, incarnated himself as Divodāsa, a mythical king of Varanasi, in order to divulge his knowledge of medicine to a group of wise physicians, including Sushruta himself, who wrote all this information down into the Suśrutha Saṃhitā. Suśrutha Saṃhitā literally translates as Suśruta's Compendium. Suśrutha means renowned. Suśrutha Saṃhitā, along with Charaka Saṃhitā, is one of the foundational texts of Ayurveda. Charaka Saṃhitā, on the other hand, was written by Charaka (alternatively written as Caraka), which is a title applied to "wandering scholars" or "wandering physicians." This particular Charaka was a native of Kashmir, and belonged to Barber Caste, which included medical ayurvedic therapist. Charaka Saṃhitā was actually a revised encyclopedic treatise, originally written by Agnivesa, under the guidance of the ancient physician Atreya in the 8th century B.C. 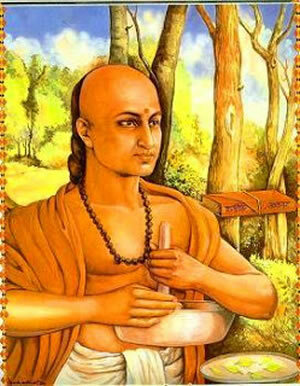 Charaka is often labeled as the Father of Ayurveda, the Father of Indian Medicine, and the Father of Medicine. He was one of the early proponents of "prevention is better than cure," as he claimed that health and disease are not predetermined but rather living healthy by putting some effort on lifestyle can increase longevity. In addition, Charaka also made contributions to the fields of physiology, etiology and embryology, which have been well recognized. He is also considered to be the first physician to present the concepts of digestion, metabolism and immunity. He was also aware of germs in the body; however he did not place any importance on them. Rather he focused on the three doshas or principles, namely movement (vata), transformation (pitta) and lubrication and stability (kapha). He claimed that illness is caused when the balance among the three doshas in a human body are disturbed. In order to restore the balance, medicinal drugs should be taken. Charaka also studied the human anatomy and the various organs in it. Charaka claimed that the human body had a total of 360 bones, including the teeth. He also rightly claimed that the heart was the center of the human body. He also claimed that the heart was connected to the entire body through 13 main channels (i.e. know today as arteries), and that any obstruction in the main channels led to a disease or deformity in the body. He also stated that apart from these channels, there were countless other ones of varying sizes which supplied not only nutrients to various tissues but also provided passage to waste products (i.e. what we now know as the circulatory system). Due to these advancements in medicinal treatise, many grant Charaka with the titles of Father of Ayurveda, the Father of Indian Medicine, and the Father of Medicine.